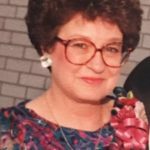 Glenda Delight Durant Suitt was born in Granbury, Texas on November 14, 1941 and passed into the arms of Jesus on January 4, 2019 while surrounded by her family. While our hearts are broken, we find great comfort knowing she is no longer in pain, which she has endured for quite some time. Glenda will be remembered for her joyous spirit, devotion to family, and the sweet love that she shared with those who knew her. Memorial service: 11:00 AM, Saturday, January 12, 2019, Wiley Funeral Home Chapel, Granbury. Her Famous Quote was Bless Her Heart. She was preceded in death by: her husband of 48 years: L.T. Suitt, Jr., Uncle Milton and Aunt Nell Kennon, Sisters: Kay Johnson, and Donna Kay Werner, and Brothers: Billy Wayne Durant, Bobby Dwayne Durant, and George Allen Reed. Glenda is survived by Son: Jeff Suitt – Arlington, TX, Son: Dirk Suitt, and wife Trisha – Granbury, Grandsons: Ryan and Mason Suitt Granbury, Sister: Wanda Merchant – Granbury, Brother: Don Kennon and wife Lometa – Granbury, Brother: John Lynn Kennon – Bedford, Brother-in-law: Donnie Johnson and wife Linda – Granbury, Brother-in-law: Fred Werner – Weatherford, Sister-in-law: Barbara Howerton – Arlington, many nieces, nephews, cousins and countless Granbury friends. Her beloved dog, Cody. i’m sure you have many happy memories in your heart and mind. Give them room to surround and sustain you in this difficult time.